The Midnight Oil blurb sounds great. Love the cover and the book trailer too. All very intriguing. Bad Spelling sounds funnier. A young witch finding her feet before she heads into more dangerous waters in the second book. Wish you success with the series. I love the title and cover for Bad Spelling. It’s on my TBR list and Midnight Oil sounds just as interesting. I also love the name rune for the brother. It may sound weird, but I enjoy reading YA books as well as adult, sometimes more. Congratulations on the new release! 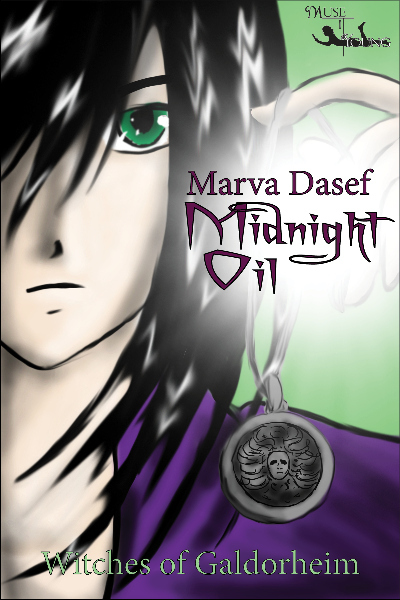 Oooh thank you Marva, I didn’t realise there was a third one in this series. Read Bad Spelling and have just finished Midnight Oil. Both stand alone, but really mind grabbing books. I thoroughly enjoyed each one and look forward to reading the third one. Well done. This book is compelling alone, and the series sounds terrific. Congratulations, and good luck with it! Thanks for dropping by. I will get your email addresses from my email notices and get back to whomever wins a copy of Marva’s book. Loved both books. I’m anxious to read the third. Kat is quite the adventuress and the characters she meets along her travels are fun and very imaginative. Like the covers and the trailers. Good luck with the sales. Thanks everybody! I’ll be offering the winner of the ebook either Bad Spelling or Midnight Oil. For those who already have the books, I have a few others from which you can choose. Hello, my darling Marva! I love following you around, blog to blog, at midnight or anytime! You are one fine writer. I love the title BAD SPELLING. Now I want to read more books in the series. Love the trailers too!